I wanted to do something scary this year, but with my own twist. Barbie Zombie was born! The costume is pretty simple and allows for lots of creativity and fun. Get a white dress, preferably with volume or layers at the bottom. I used the same dress from my Smurfette costume in 2008 – I bought it for like $10 at a cheap local clothing shop. Really, you could use any white outfit (jumper, shirt/ pants, etc.) depending on your skimp level and how much body paint you want to use. Next is the fun part – the destruction! I cut the bottom of the dress in jagged edges, with some longer and shorter shreds. The longer your dress starts off, the bigger shreds you can have. You can also cut the top and sleeves if you want. I took three different shades of pink nail polish to resemble blood splatters on the dress. I used the dark pink for most of the work, and highlighted with the lighter shades. Make sure to ventilate the room! Have fun with it and make different types of "blood stains". I did big and small splatters, a dripping look, a big "X", and some stitches. This was great because I already had the nail polish on hand. You can buy some at the 99 cent store or get regular fabric paints if you want. The nail polish provides a nice, wet look. Finally, I added some bling. This isn't really necessary, but Barbie is fabulous and I thought it would add a nice touch of sparkle. I took a cheap CZ necklace that I had and clasped it around one strap of the dress. No sewing necessary! I tied the excess band around the back of the strap so it wouldn't fall off. I bought some pink braiding hair and Manic Panic Dyehard temporary hair gel in Stiletto (metallic silver). I braided in the pink hair to the bottom half of my hair, using the pink hair as two sections and my own hair as the third section of the braids. I only braided a few inches down so I could tease out the rest. I then teased out my hair with a comb, starting from the roots. This was some major teasing! Once I got through the entire head of hair/ extensions, I re-teased the roots again and added the silver gel to hold it in place. I put the gel over most of my hair/ extensions. My hair is light blonde, so the silver looked really nice on top. Overall, I was going for a messy but dead-glam look. *I did the costume 2 days in a row, and skipped all the hair stuff the second day. I just crimped it and wore it down, and I actually preferred it that way. It looked more Barbie doll-ish since my hair is so long and light. Plus, the pink extensions were really annoying after a while, although I like the way they looked. After putting on the dress, I painted my skin white using Ben Nye Magicake make-up. I used cheap makeup sponges and dipped them in water, then to the magicake paint. I blotted it on my body, for a gritty unfinished look, not a clean pure white. I put the paint on my face (avoiding the eyes/ lips), neck, chest, arms, legs, and the back of my hands. It dries really fast. Next up was the face makeup. I took black sparkle loose eye shadow and applied all around my eyes. I then added some contouring of gray on my forehead, nose, and cheeks. This was to hollow me out. I took some pink and added it under my eyes and around the contouring to add some more depth (and of course, pink). I then added false eyelashes. Finally, I did my lips with hot pink lip liner, lipstick, and gloss. I added more pink lipstick around my lip line for a messy, disturbing look. Then I took various colors of eye shadow (black, grey, pink, and dark purple) and smeared it randomly on my arms and legs to look dirtier. I also added some stitches on my arm with black eyeliner. Once all the paint and make-up was dry, I added in my accessories. I put on the necklace and wore the crown to the side. It also helped to keep my bangs out of my face. That's it! Fun, easy, and totally customizable! 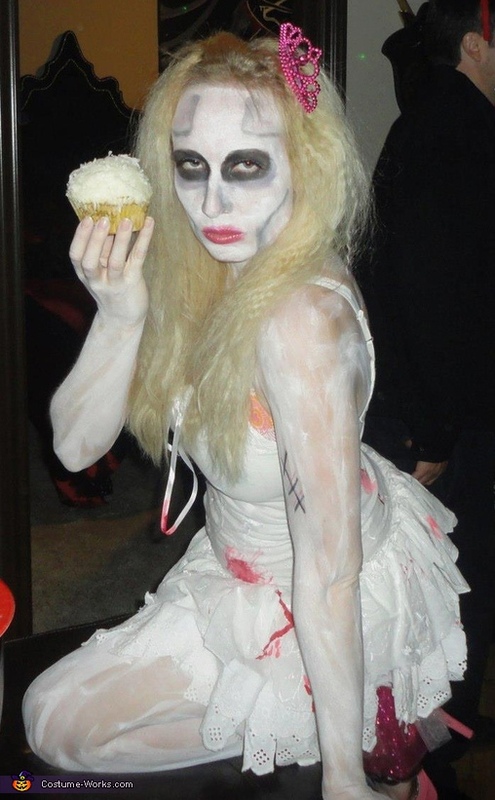 I loved being Barbie Zombie and my costume was a hit everywhere I went.